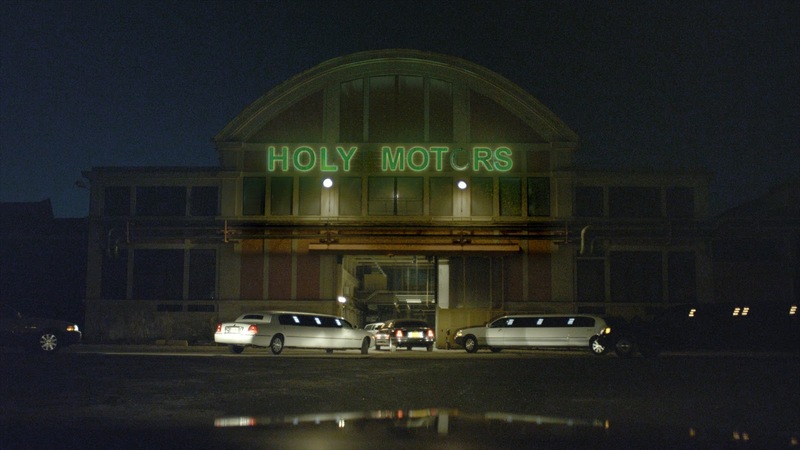 Holy Motors was presented in the official selection at Cannes in May, and was probably the most innovative film in the competition. It caused a lot of discussion and was loved by those who appreciate art cinema and made those expecting a film that follows the conventions of classical narratives uncomfortable. However the unusual film that focuses on identity is a cinematic rarity. Leos Carax' dystopia is set in Paris and is about a man whose everyday job involves acting out the various identities of a variety of people. In the initial scene morning, Monsieur Oscar (Denis Lavant), is a middle-aged businessman, picked up in a white stretch limo. He lives in a beautiful mansion and is chauffeured by Céline (Eva Scob) all day. On his seat is a notebook with his second job. In a traditional narrative since the setting is established we would be pulled into the identity of the characters and lifestyle of our lead. The businessman turns out to be one role, and being a middle-aged street lady is another. Within the same day Monsieur Oscar also goes to Père Lachaise cemetery and acts out certainly his most bizarre unconventional role. But the fact that he constantly changes identities and draws us into character identification is disarming. At a photo shoot of a beautiful model (played by Eva Mendes) Monsieur Oscar has undergone another makeover where he wears a red wig has one false eye and long grotesque fingernails. He is barefoot and walks with a cane. The photographer decides to play with this freakish occurrence and incorporates this little man into the photo shoot. He decides that his model Beauty has found a Beast but only on a superficial level for in the next few minutes the little man bites the fingers of the photographer's assistant, kidnaps "Beauty" and takes her to an underground crypt. Here he dresses Beauty in a Middle East burqa, which draws attention to the fantasy of appearances Beauty does not protest, and the little man lays his head on her lap. Monsieur Oscar is also a father with a daughter, and we think that this is the real Mr. Oscar finally. He picks up his daughter who has hid in a bathroom at a party and has a father daughter talk with her. Next he is a murderer who kills his double, thereby destroying his own image. When he is later an old man taking his last breath, Monsieur Oscar has gone through some real metamorphoses but not before he returns home to another family. 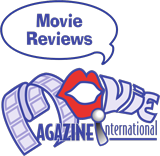 The scenes are carefully composed as small vignettes that are thought provoking. Not only does Monsieur Oscar assume identities the environments change too. Many parts of Paris such are the sites of different kinds of architecture from different time periods such as the Notre Dame, the Eiffel Tower, and tract homes outside Paris. Leos Carax' addresses motion capture cinematography with Monsieur Oscar animating digital character models for video games and virtual reality. Monsieur Oscar meets a depressed colleague on top of an abandoned building. She is played by Kylie Minogue, who has been also chauffeured in a white limo. 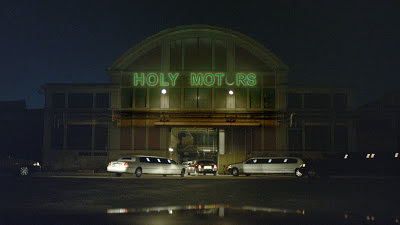 The title Holy Motors has special meaning meeting for the transformative process of the passengers in these white limos. Mr. Carax has had a long absence from moviemaking and is best known for Les Amants du Pont-Neuf - the lovers on the bridge in 1991Holy Motors in such an absence has many messages - about the death of cinema with motion capture cinematography, the death of pop culture with the scenes with Kylie Minogue and Eva Mendes the death of Industrialism with gutted out abandoned buildings. There are also shapeshifting messages about gender and identity. The critical response to the film was either exuberant or morose. It will most likely enjoy the same reception in Paris’ sister city San Francisco. For Movie Magazine this is Moira Sullivan, Cannes.